Not sure which exercises for shoulder pain you should be doing? Or not sure how to do them correctly? Wondering why your shoulder pain isn’t getting better with your current exercise program? If this describes you, then you’ll get a lot out of this complete guide. There’s a lot of information packed into this guide. Before you feel overwhelmed, take a deep breath! We have a solution. To help you get the information you need, we broke everything down into a table of contents below. Simply find the information that you’re looking for, click it, and you’’ll be taken directly to that section. That way, you can either read the entire article from the start, or read certain sections that will interest you. Who shouldn’t stretch their shoulder? How long and how often should I do my rotator cuff exercises to see results? How much weight should I use with rotator cuff strengthening exercises? Does it matter which shoulder injury rehab exercises I do first? Not all shoulder pain is equal. Some of you that are reading this article may have already been told what type of shoulder pain you have. You may have already been given a medical diagnosis, or even tried your own remedies for sore shoulder. Some of you may just want a quick stretch to help out a general sore shoulder. That being said, not all exercises are going to be helpful for your situation. If you’ve had shoulder pain for awhile, it’s best to get checked by your physician or therapist to make sure there aren’t any specific things that you shouldn’t do. We won't be going through anything specific, like shoulder pain and cancer, shoulder pain while sleeping, or exercises for frozen shoulder. This article provides the best, and worst, shoulder exercises for general rotator cuff pain. This article breaks down exercises into different sections, based on what your goals are. In each section, you’ll be shown the exercises for shoulder and upper arm pain that you can do. More importantly, we go through some of the exercises you should avoid. I’ve found that knowing these are sometimes more important than knowing the correct ones. That’s because it’s very easy to cause more damage and delay recovery if you’re doing the wrong exercises, especially with rotator cuff surgery pain. Stretching exercises: We dive into the best stretches for your shoulder, including some common ones that you should be avoiding. Strengthening exercises: We specifically discuss how to strengthen the rotator cuff muscles in this section, including dumbbell exercises for shoulders. Do these wrong and you’ll risk making matters worse. Middle back exercises: Your posture can affect your shoulder pain. We’ll show you why exercise for shoulder pain relief should involve strengthening the middle back through a shoulder blade workout and making sure these muscles work properly is the missing link to full recovery. This is a stretch that is often performed to stretch the chest muscles. However, we’ve found some good uses for this in anterior shoulder pain (in contrast to pain behind shoulder in the next exercise). The key difference between this stretch and the one we want to avoid (to be discussed shortly) is that this limits the ‘overstretch’ of the front shoulder capsule. Instructions: Hold stretch for 30 seconds. Repeat with opposite arm. If doorway is narrow enough, you can stretch both arms at the same time. Repeat 3 to 5 times. ​Avoid if you feel any sharp or throbbing shoulder pain. This is probably the best shoulder stretch you can do. Most of my patients are surprised when I recommend this one for anyone recovering from shoulder injury. I get things like ‘This looks so simple. Is there anything else?’ or ‘my shoulder pain is in the front. I want to stretch that’. The thing is, stretching for the shoulder is not as important as strengthening as we will shortly discuss. As far as stiff shoulder exercises go, this is at the top of the list. Instructions: Hold stretch for at least 30 seconds. Try not to hike up the shoulders as you are doing this. You should feel a gentle stretch in the back of the shoulder. Repeat 3 to 5 times. ​If you feel any upper arm and shoulder pain, stop immediately. This is one of the most overlooked stretches. However, caution needs to be taken when doing this. Start the stretch slowly and do not try to force it. If you feel pain between shoulders or anyone else, you are stretching too aggressively. This stretch targets the one rotator cuff muscle that is often overlooked. The front shoulder stretch is something you’ve probably seen a lot of people do. Most people tend to stretch their shoulder and their chest this way. You may see people at the gym doing this, or even at work. The problem is, you are over-stretching the front joint capsule and shoulder ligaments, and not necessarily any muscle. With this stretch, a lot of online resources show this to stretch the rotator cuff muscles, which may cause posterior shoulder pain. However, let’s take a closer look at this stretch, especially if you're doing your shoulder workouts at home. In the image above, the stretch is shown in the left image. Notice how the shoulder is hunching forward. 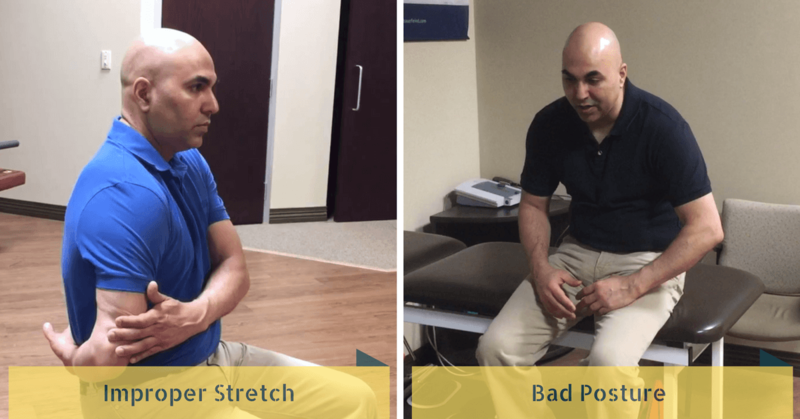 On the right, you'll see an image of a hunched over position from bad posture. Notice any similarities to these two? They both look like they are the same position. If you’re someone that sits hunched over all day at the computer and want to know what can you do for shoulder pain, you may come across this stretch. If you begin performing this exercise, you’re pretty much stretching into the same position you have been sitting in. You are basically OVER STRETCHING the rotator cuff. If the muscle is already in a stretched position all day, you may not want to add this stretch. So what is the option for those with rotator cuff issues, or general shoulder and upper arm pain? The best strategy is actually to strengthen the rotator cuff instead of spending time stretching. This is also one of the common shoulder pain stretches that is prescribed in some therapy setting. The sleeper stretch has been used in recent studies and has been found to be helpful in increasing range of motion in tight shoulders. However, this test has been modified since the original way may not be that helpful. To get a better idea, take a look at the image above. The first image is the sleeper stretch, which is supposed to provide relief from shoulder pain. 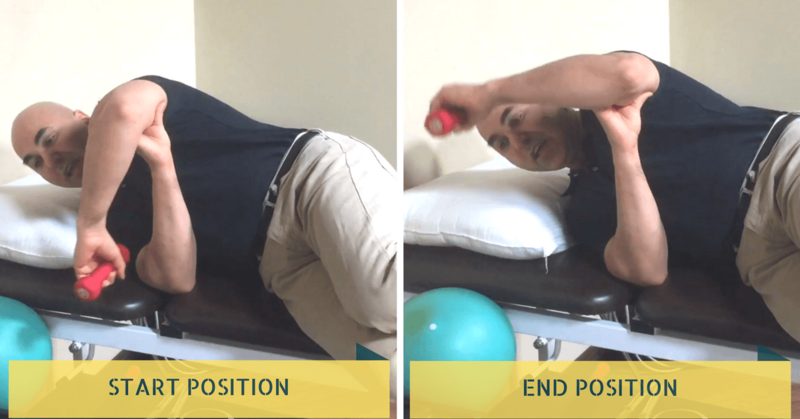 The second is the same position turned around to show a test we use to assess impingement. It's called the Hawkins - Kennedy Impingement test. It’s the exact same position! So why would you do a stretch that is doing the same thing as a test that recreates pain? 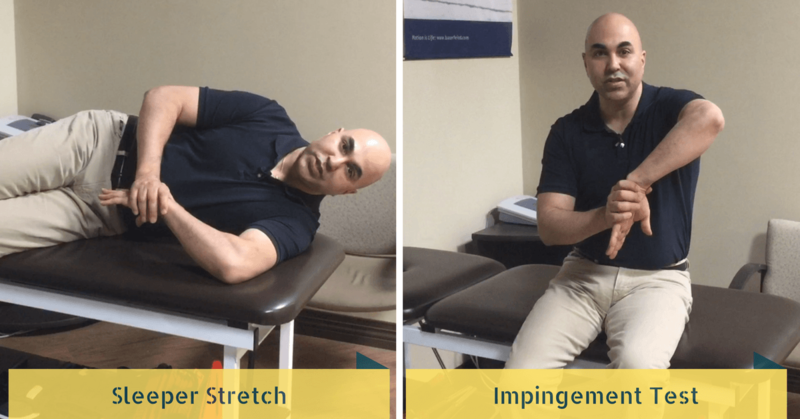 There’s some debate on whether the sleeper stretch is useful or not. 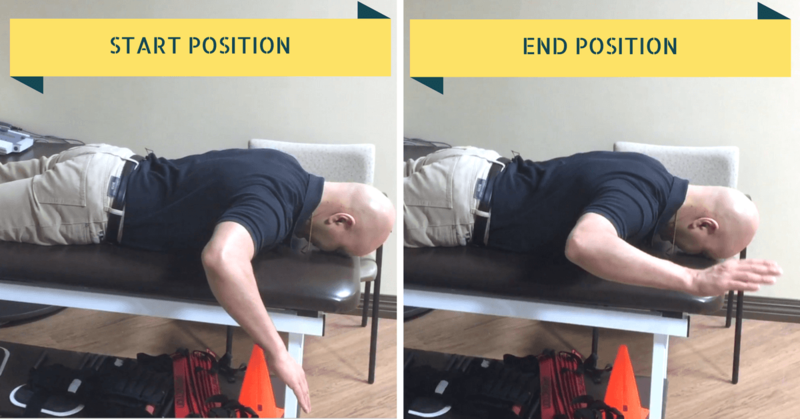 New research shows that the modified sleeper stretch is helpful. However, there are other stretches you can do that may be much better. To get an idea on how to perform a modified sleeper stretch the right way, check out the article by Mike Reinold here. Apart from stretching the wrong way, there are certain people that may need to be more careful with shoulder stretches for pain than the rest of us. In this section, you’re going to see if you are hypermobile. If you are, then you may need to do less stretching and more strengthening exercises to stabilize the joint. With stretching, you run the risk of over stretching and actually damaging the joint and ligaments. So how do you know if you are hypermobile? 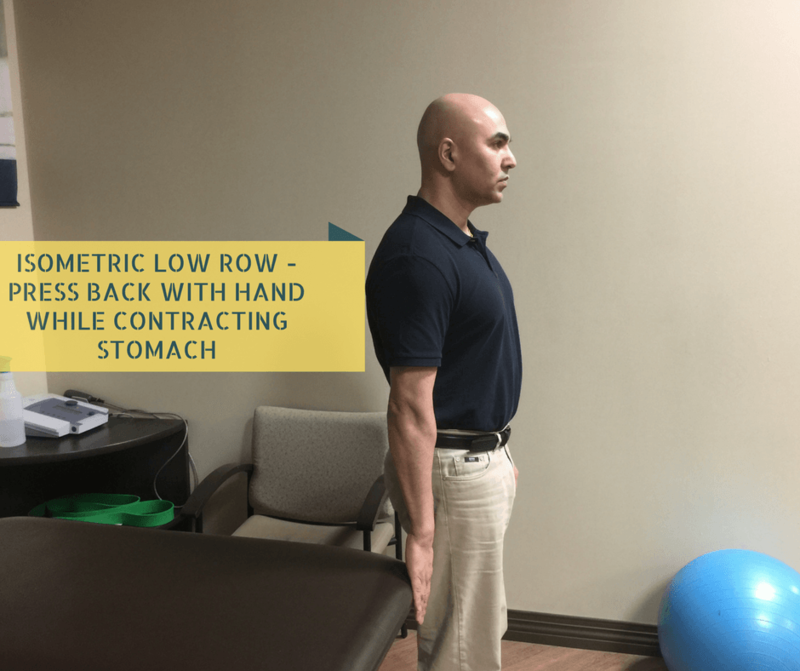 If you want to learn more about why stretching may not be good for hypermobile individuals, check out the short article by Eric Cressey here. Although all types of exercises are good when it comes to learning how to help shoulder pain, strengthening exercises are probably the most important. They’re also the exercises that a lot of people misunderstand after shoulder muscle injury. There’s always a sense of fear in causing more injury. When it comes to the best shoulder pain relief, most people assume it's stretching. However, research shows just the opposite. Even in shoulder tendons like rotator cuff tears that surgeons believe can’t be repaired show improvements with strengthening exercises. (Reference) When done right, they can have a significant impact on your shoulder pain therapy outcome. What is the best exercise to strengthen the rotator cuff muscles? When we talk about the rotator cuff muscles, we’re actually talking about 4 different muscles. All four can't be exercised with one single exercise. That’s where there is no ‘one’ exercise that is the best exercise for shoulder pain. 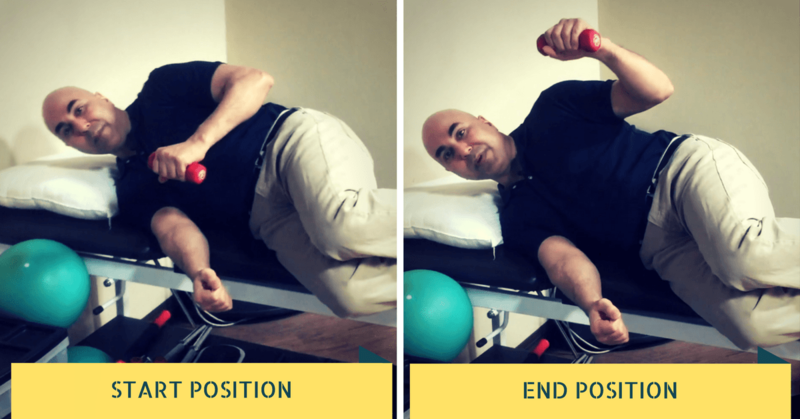 Strengthen the supraspinatus and infraspinatus while minimizing deltoid muscle activity. The surprising thing about this exercise is that you really don't need to use weights for it. The key is to develop proper form rather than trying to use heavier weights. Using weights at around 2.5 to 5 pounds is all that is necessary, although I rarely go over 2.5 pounds myself. A strict form is crucial to success, whether done in therapy or during a shoulder home workout. Make sure you don't try to raise your arm too high. This can lead you to raising your head and arching your back. In this exercise, lie down on your side. You should have about a 15 degree space between your elbow and the side of your body. Try putting a pillow or towel there so you don't have to initially remember to do that. Keep your arm at 90 degrees and raise your arm up. Imagine your elbow as a hinge to a door. Your forearm is the door. As you open and close the door (or in this case, externally rotate the arm), the elbow and upper arm remains fixed. This exercise to help shoulder pain is best performed with very low weight (about 2.5 pounds) and high repetitions. For some, high repetitions can be 10 to 15, while for others it can be 30. Trust me, the exercise appears really simple in the beginning, but it doesn't take long for the rotator cuff to start burning! The exercises above are effective for the infraspinatus and rotator cuff in general. However, the infraspinatus muscle may also benefit from a specific exercise. This muscle is responsible for dynamic shoulder stability. 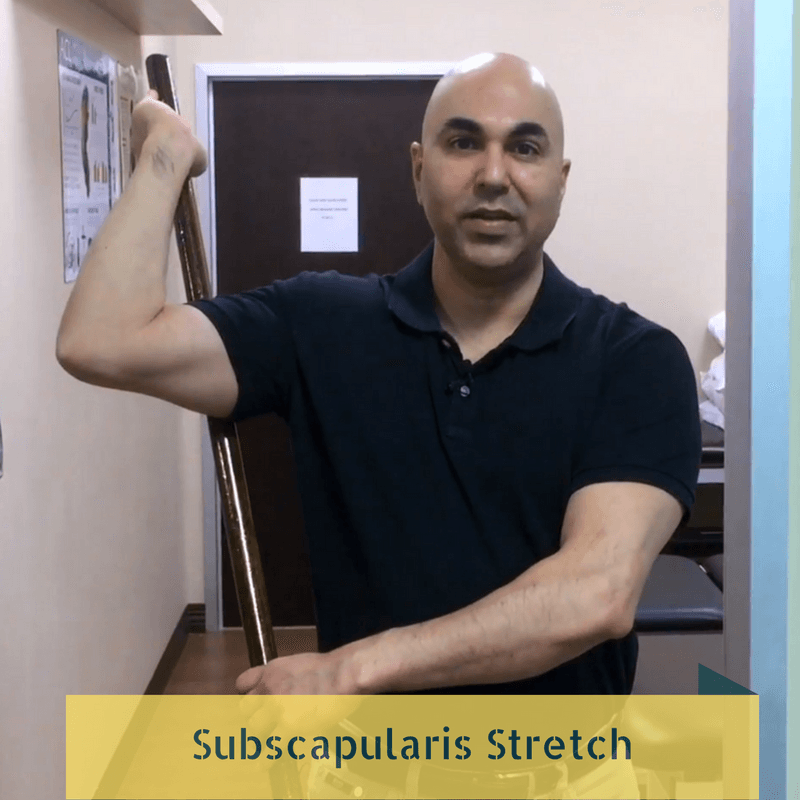 If you have rotator cuff issues, or looking for a good rotator cuff repair recovery exercise, this may be another exercise to add to your list. Research shows that the side lying wiper is better at activating the infraspinatus and limiting the activity of the deltoid muscle. As you can see from the image above, use your opposite hand to brace your arm. The motion is very similar to the side lying external rotation shoulder pain workouts. ​The shoulder internal rotation exercise involves the same movements as the external rotation exercises, except it's in the opposite direction. Sitting or standing with the elbow at 0 degrees to the body is the best position. You can also do this exercise with a resistance band or a pulley at the gym or your health professional's office. Goal is to do higher repetitions with low weight. 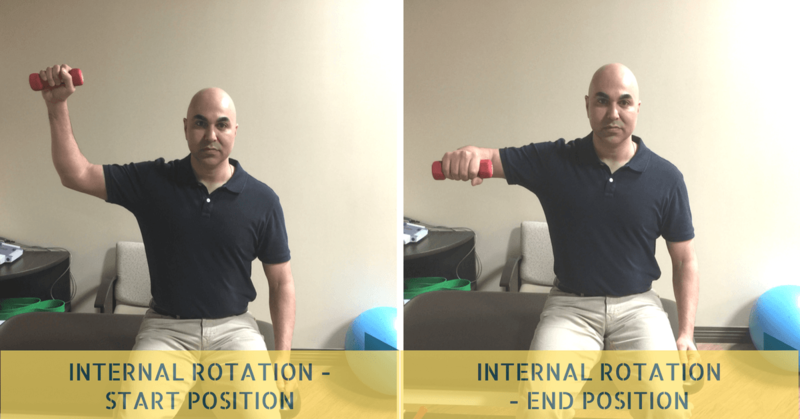 Internal rotation exercises are great for the rotator cuff muscles or general shoulder injury recovery. However, there are many positions in which you can perform them. Since they all look like they are doing the same thing, they are sometimes recommended without looking at what your goals are. 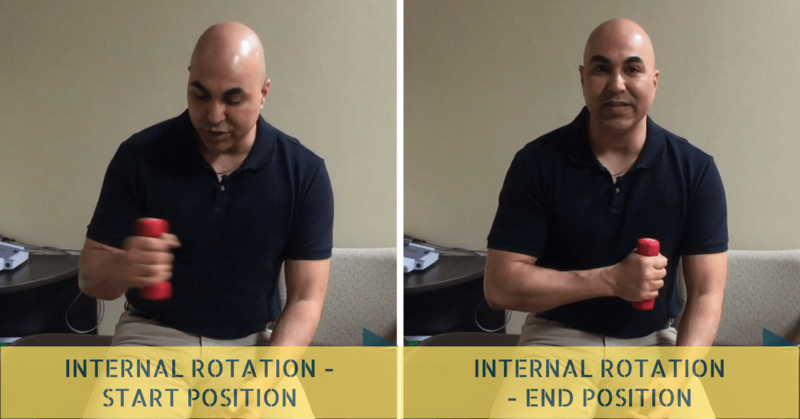 For the internal rotation with shoulder at 0 degrees, you are getting less deltoid muscle activity than the standing 90 degrees abduction and standing 90 degrees abduction with zero position. Therefore, this shoulder and arm pain exercise may be the best if you are trying to minimize any deltoid activity. If you have impingement or rotator cuff injuries, it may be best to stick with this in the beginning. To recap, there are 4 muscles in the rotator cuff. There is the supraspinatus, infraspinatus, teres minor and subscapularis. So what shoulder exercises for pain is best for the subscapularis? Stretching or strengthening the shoulder? Which is better help for shoulder pain? If I had to choose between stretching and strengthening, I’d choose strengthening workouts for rotator cuff injuries, more often than not. In some cases, stretching may be better. For example, if you have an injury or condition like frozen shoulder, some simple stretches may be more helpful. One of the main reasons why we recommend strengthening over stretching is because stretching is mostly performed the wrong way. Some people stretch that shouldn’t. Others stretch the wrong way to the point that they are doing more damage than good. You are basically raising your shoulder and then rotating your arm in. This motion pretty much jams your rotator cuff muscles into your AC shoulder joint. That’s not the best use of your time. 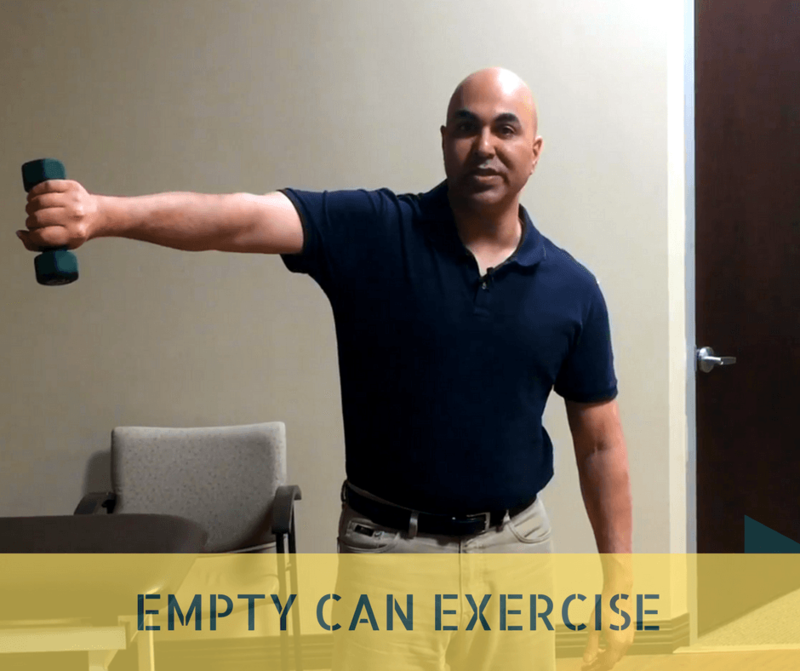 The empty can position is actually used as a ‘test’ to see if your rotator cuff is injured. If a test is used to provoke pain from an injured tendon, then why are we using it as an exercise? It’s recommended that you avoid this as one of your shoulder pain relief exercises. The upright row exercise is another one of those shoulder tendonitis exercises that places the shoulder in a bad position. The image above demonstrates this well. On the left, you have the upright row exercise. In this, I'm lifting a barbell. In the right image, you'll notice the position that we place the shoulder in to see if there's any impingement. Can you see how they are similar? 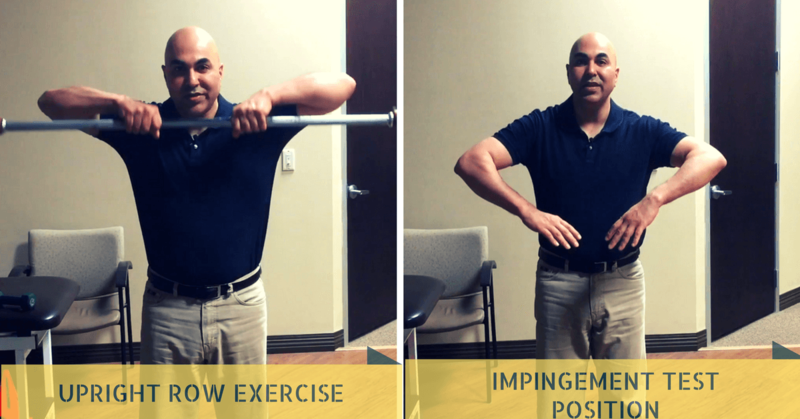 Every time you do the upright row exercise, you are basically repeating an impingement test. The test is designed to 'recreate pain from an impingement or injury'. If you have been doing this for your back and shoulder workouts, stop immediately. If you see someone doing this, tell them to stop immediately also! Exercises to help shoulder pain are generally done with 3 sets of 10 - 15 repetitions, twice per day. For example, let’s say you are doing a shoulder external rotation exercise with 5 pounds. Do it 10 to 15 times. Rest as long as you can, usually between 30 seconds and 1 minute, and repeat 2 more times. They recommend twice a day but you can get away with once per day. You will need to perform the exercises for at LEAST 12 weeks to begin seeing some improvements in treatment for rotator cuff. Mind you, you’ll start seeing results earlier in terms of strength, pain and range of motion, but a good 12 weeks shows how important it is to develop a habit in doing your exercises. If you are thinking of surgery, especially if you’re shoulder isn’t getting better (or has underlying shoulder inflammation), the range of time to give yourself with your exercises varies quite a bit, from 3 months to 18 months. As you can see, there really is no hard date that you can use to justify surgery, just because your shoulder pain physical therapy isn’t working. If you’ve seen some of the videos here on rotator cuff strengthening exercises, you’ll notice that the weight used is quite light. The maximum weight you want to use is 5 pounds. But is that even too much? To stay in the perfect sweet spot, I usually recommend about 2.5 pounds. There will be a tendency to use more weight, just because you feel like you want to ‘lift more’. I highly suggest not doing that. After reading this article, you may find that you’re doing a few different types of exercises. You may be performing shoulder blade exercises, followed by rotator cuff strengthening. The biggest question I get is, “does it matter which sore shoulder treatment exercise I do first?” Some of the reasons are simple. You may find a certain exercise gets you tired quicker. You may not have enough energy to finish the rest. So the answer is, it really doesn’t matter. A study was done that actually looked into this. (reference) With exercises for shoulders and back, they compared the sequence of shoulder blade and rotator cuff exercises. One group performed shoulder blade exercises for 4 weeks, and then followed up with rotator cuff exercises. The other did the reverse. 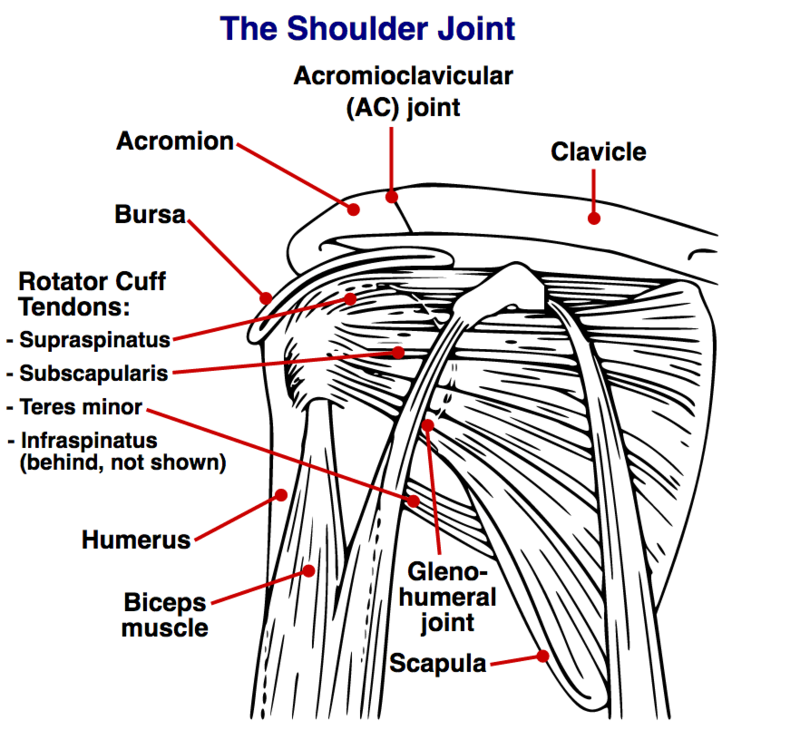 The found no difference in shoulder tendon pain. In some cases, performing shoulder strengthening exercises (such as shoulder pain when lifting) can cause pain. This can be frustrating to anyone that wants to learn how to relieve shoulder pain. There are some that are showing that a bit of pain is okay, even with torn rotator cuff exercises, while others that provide physical therapy for shoulder pain are strict with making sure all exercises are performed with no pain. Again, it depends on what type of sore shoulder pain you have. If it’s a chronic rotator cuff problem, then performing your strengthening exercises with some discomfort is acceptable. If you are just beginning your strengthening program after surgery, then most likely you need to be more strict with your shoulder routine. If your shoulder is painful with exercise, start strengthening the other shoulder. A study (reference) found that strengthening the opposite shoulder actually increased strength of the shoulder with pain. The study didn’t mention anything about this resulting in less pain, but it’s an excellent way to start on your path to reducing pain in the long term. One of the biggest issues is fear of exercising, because it may cause more harm. When someone has that belief, it’s a lot harder to get them motivated to begin their exercise program. By starting with the pain free side, you’ll be able to ‘sample’ the exercises, feel what it’s like with a pain free shoulder, and then gradually begin adding them to the painful shoulder. Instead of beginning with rotator cuff tear treatment strengthening exercises, begin with scapular (shoulder blade) exercises first. If you have, for example, a rotator cuff tear, that is painful when you exercise, you’d be surprised to learn that you will use more of your upper trapezius muscles (which is bad) than someone with a rotator cuff tear that is not painful when exercising. (reference) This is where the ‘no pain no gain’ type of attitude is dangerous. Trying to push through the pain can actually keep making things worse by over using the muscles that you shouldn’t. Did you know that the middle back exercises, also known as scapular exercises, are just as important for the shoulder? Arm movements, or working overhead with your arms, requires not only proper movement of your rotator cuff muscles, but also your shoulder blade. If your shoulder blade is not moving in unison with your shoulder muscles, the upper arm may not move smoothly. This can lead to jamming of the joint into the tendons. Over time, this can lead to degeneration of the tendon. In the past, researchers figured out that the muscles in the shoulder blade area were ‘weak’. Recently, that research is pointing more towards a muscular imbalance, and not necessarily strength. That’s why simply trying to strengthen the area may not give you the best results. There are countless exercises out there to work the shoulder blade area. However, some may not work as well as others. In addition, some may actually lead to more problems than relief. That’s exactly what we’re going to discuss in this section. With the shoulder strengthening exercises, our main focus was to strengthen the rotator cuff muscles while making sure we contracted the middle deltoid muscles as little as possible. For shoulder blade exercises, the goal is to contract the middle and lower trapezius muscles while making sure we get very little upper trapezius activation. The following are excellent shoulder blade exercises that increase contraction of the middle and lower trapezius muscles, while minimizing the activity of the upper trapezius. With this exercise, you can start off with no weights so that you can learn how to contract the muscles the right way. As you can see in the video, the arm can be raised about 135 degrees. Try not to extend your arm so much over the head that your upper shoulders (upper trapezius muscle) begins to hike up and starts contracting. Remember, this is what we don't want. You may notice that this is one of the best exercises for the rotator cuff. We showed it in the rotator cuff strengthening section. However it’s also very effective for middle and lower trapezius activity. You can perform this exercise in many different angles. However, muscles perform differently depending on the angle. 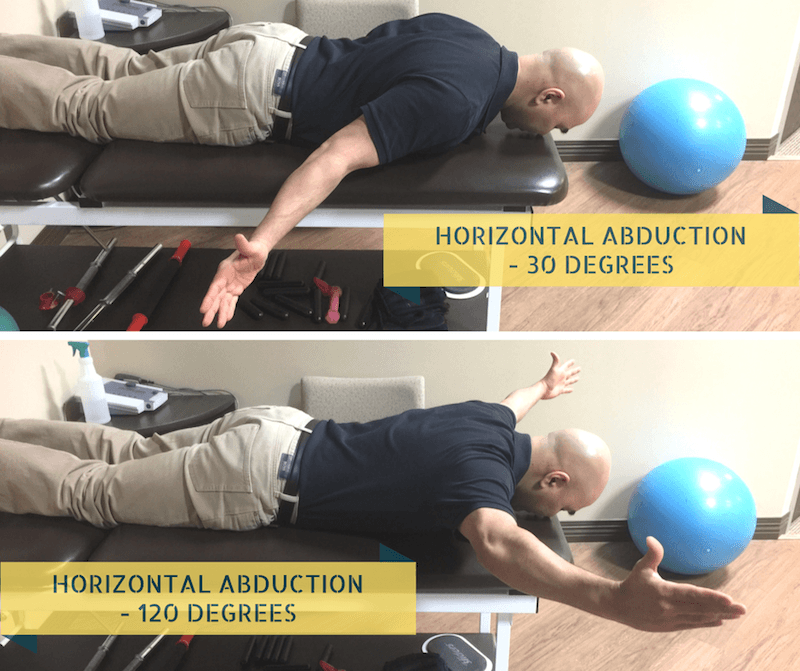 Prone horizontal abduction at 120 degrees and external rotation is great for producing a high activity of lower trapezius muscle, which is what we want to do. However this also increases the activity of the upper trapezius. A good balance is that if you’re in the early stages of rehabilitation, performing this at lower angles like 30 to 60 degrees is recommended. To summarize, the higher angle you go, the more upper trapezius activity occurs. ​Also, start off with no weights and learn how to get proper muscle contraction. Learn not to hike your shoulders when you raise your arms. This is another great exercise to perform. The goal of all these exercises is to perform them slowly and within proper form. Quality is much better than quantity. Performing the Push Up Plus on an unstable surface actually activates more of the Serratus Anterior and scapula stabilizing muscles. However, I usually don’t recommend performing these exercises on an unstable surface since they don’t really provide much ‘extra’ advantages. Some studies show that it activates the Serratus Anterior (reference) while others note that it doesn’t (reference). If you also take into consideration a fear of falling off an unstable surface, or being cautious, you really don’t need to progress to an unstable surface unless you’re an athlete that wants to increase the level of difficulty. Performing the Push Up Plus on the floor is slightly better than performing it against a wall. 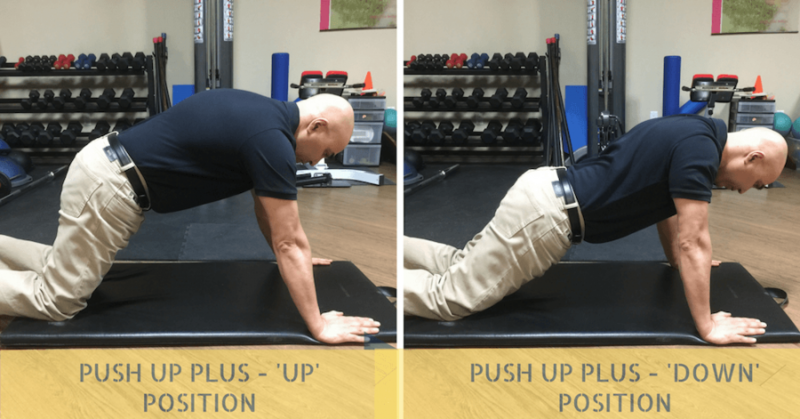 The reason is that a standard push up plus on the floor produces less upper trapezius activation compared to standing against the wall. (reference). 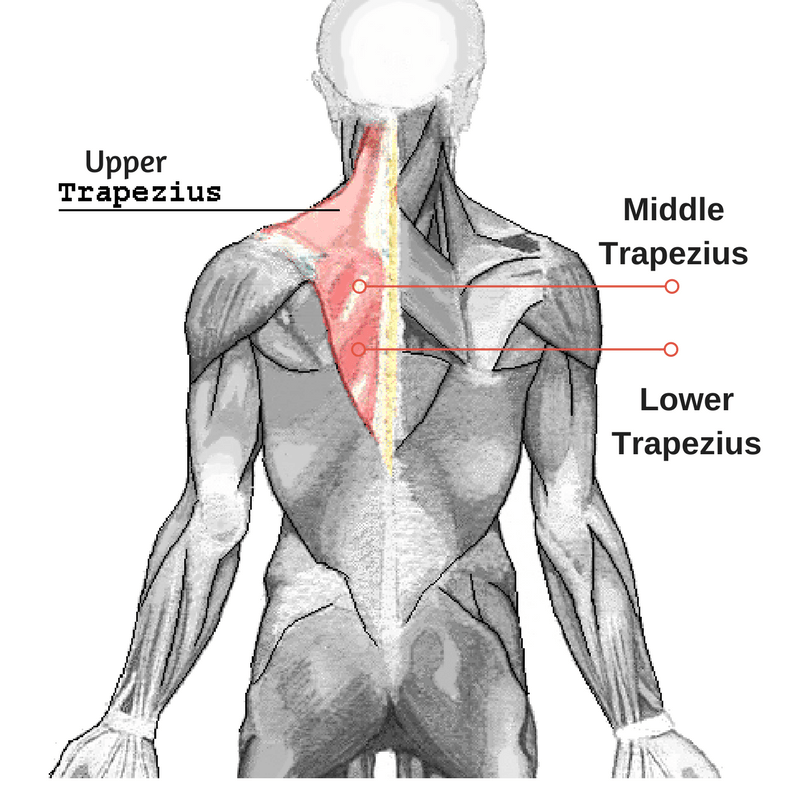 Quick Note: As we try to produce more Serratus Anterior activity, we want to produce less upper trapezius activity. However, there’s another muscle we want to limit with respect to the shoulder exercises. That is the Pectoralis minor muscle (one of your chest muscles). Some say that a Push Up Plus also produces more contraction of the Pectoralis Minor, which is something we don’t want. I believe that is more related to doing the exercise while lying down and pressing your hands up. It’s one thing to note in case you hear information about overactivity of the Pectoralis Minor muscle with a Push Up Plus exercise. This article was done to provide the best shoulder stretching and strengthening exercises, including ones to completely avoid. However, there are more exercises that you can do. That's why some people may go to their therapist and given an exercise that I haven't gone over. That's okay. Your therapist may be the best and first line of defence in making sure you get the right exercise for your own specific situation. I hope this article at least provides a good summary on exercises for shoulder pain that you can use to help guide you in the right direction.